The first night on the 2012 Maria Lenk schedule, which unlike most National Championship meets this year won’t align too closely with the Olympic schedule, is not the most notable for the Brazilian fans. Many of the big stars (Pereira, Cielo, Fratus) will wait until later in the meet to get their first cracks in major races. We did see a South American Record go down (the only reason it’s not the headline is because it was in the non-Olympic men’s 50 back). The Brazilians did get a big thrill on the first day from Tales Cerdeira in the 200 breaststroke, when he swam a 2:10.37 in prelims. That’s the 8th-best time in the world this year, and moves him ahead of Thiago Pereira for the second Olympic qualifying spot. Pereira didn’t swim the race here, and probably wouldn’t have in London anyway, but this erases doubt for Cerdeira. The final, however, was a bit controversial. Cerdeira revealed after prelims that he has an injured right thigh, which seems like it would mean “meet over,” or close to it, for a breaststroker who’d all but locked up their Olympic spot anyway. But he pushed through for a 2:12.40 anyway, which is a risky move this close to the Olympics. Felipe Lima made it a much close battle in the final, swimming a 2:12.82. Henrique Barbosa, who’s also on the Olympic Team thanks to a 2:09 last year, swam a 2:13.52 for 3rd. He seems to be swimming straight through this meet, and punting on a possible second bid in the 100, to focus on his Olympic result. 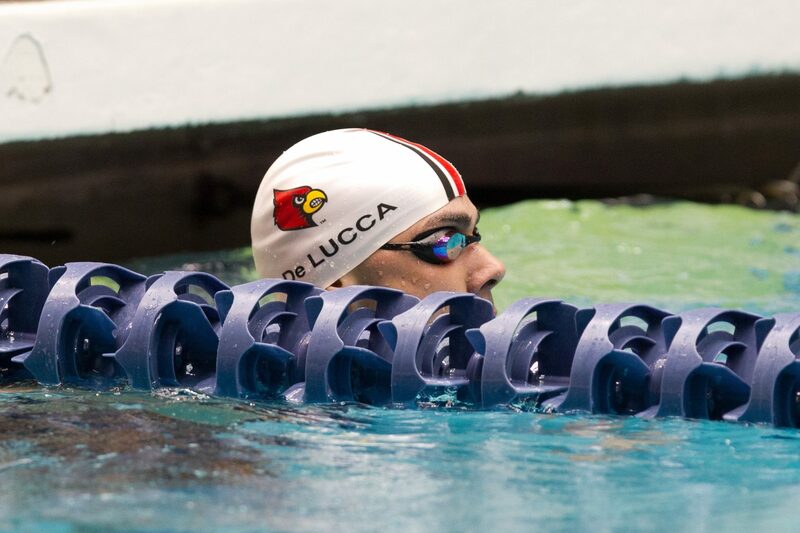 Louisville All-American Joao de Lucca has been getting a lot of hype; his massive improvements as a sophomore in the American college scene led to a lot of hope for him back home in Brazil. That at least partially came through, with a new Meet Record in the men’s 200 free in 1:48.26, which is 18 big bonus points for Flamengo (the equivalent of a 5th-place finish). That puts him into the top-5 all-time in Brazilian history, and he’s only 22-years old. He could give Brazil back the force in the 200 free that they’ve been lacking since Thiago Pereira stopped swimming the event seriously. De Lucca said after the race that he was shooting for a 1:47-mid, and a FINA Automatic Qualifying Time, to lead off Flamengo’s 800 free relay later in the meet. He finished this 200 very strong, and as such might have that time in him. Minas’ Nicolas Oliveira, one of the men on that list ahead of de Lucca, took 2nd in 1:48.79. He was already a 1:48.0 in December, but it’s clear that his focus at this meet is holding onto his top-four spot for the 400 free relay. He was within a few tenths of earning an Olympic spot in this 200 last year, and still seems to have not gone after it all that hard. American Charlie Houchin, who for this meet is teamed up with Oliveira, was 3rd in 1:48.83, and Minas completed a 2-3-4 finish with Rodrigo Castro touching in 1:49.75. 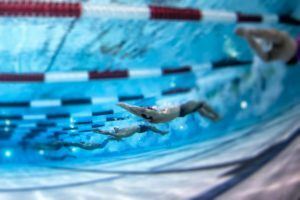 Corinthians struck first blood among the international swimmers (remember, each team is allowed to bring in a maximum of two to score points for their team) when Denmark’s Lotte Friis won the women’s 200 freestyle in 1:59.65. That scored bonus points (70 to be precise) by topping the old mark from 2009 held by Monique Ferreira in 1:59.78. (Friis didn’t break the South American Record, but she still gets the points as she was faster than that record. Her swim does stand as the Meet Record, however). 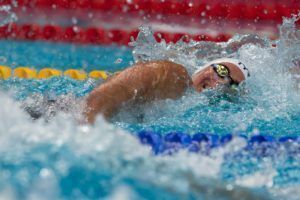 Friis is never going to be challenging for Olympic medals in this race, but that is her best time of 2012 and an outstanding swim for her at this time of the season. Depending on how many races she swims between now and then, she could put up big numbers in the 400 and 800 (she won the 1500 timed final later in the day). The top-finishing Brazilian was in 2nd place in Manuela Duarte, who touched in 2:00.27. That makes her the second-fastest Brazilian woman in history. 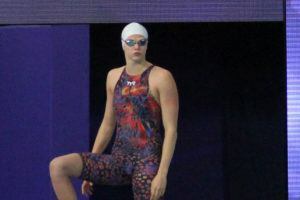 France’s Laure Manaudou, swimming for Pinheiros, was 3rd in 2:00.43. 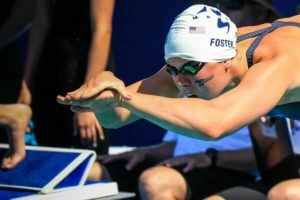 That shows that she isn’t much prepared for this meet in terms of a “rest” or “taper,” but if she’s in the kind of heavier training that this time indicates, then it could pay off for her over the longer haul (she’ll be called on for many swims at this meet). 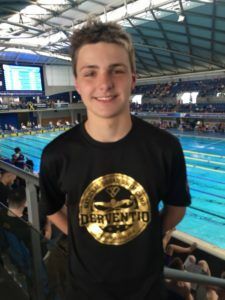 Pinheiros’ Daniel Orzechowski broke the first of what could be many South American (and by necessity, Brazilian) records of the meet in this 50 back. It’s not an Olympic event, but his 24.44 broke the 24.49 held by Guilherme Guido from 2009. Guido was 2nd in this race in a 24.8. It’s also by far the fastest time in the world this year. He didn’t have a great year in 2011, but consider the comparison. This 50 time is more than a second faster than he has been this year; given the 55-mid he had in the 100 back at the Indy Grand Prix, we very well could see an Olympic Qualifying Time from him in that race (if not much, much more). 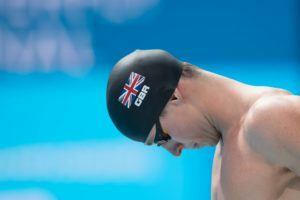 He’s generally better in the 50 than the 100, but when a swimmer makes a huge improvement like this, there’s always great hope for the rest of his races. This also gives him an enormous, 70-point bonus. That’s the equivalent of winning two races. Record bonuses could decide this meet, and Pinheiros just got a big leg-up with this one. Guido was 2nd in 24.82, which is 4th in the world and a good time for him as well (in textile). He’s the better 100 swimmer of the pair, though a best-case scenario of two under the FINA A time could be developing. American Eugene Godsoe was 3rd in 25.01. That’s a best time, not that he swims this race all that often, and is the 8th-best ever by an American. He could be in for a good, pre-Olympic test in the 100. Minas’ Fabiola Molina looked so-so in her first race back from a doping suspension, winning the womens’ back in 28.74. That beat Laure Manaudou, who was 2nd in 28.81. Molina is going to have to be much better in the 100 to make the Olympic Team. Corinthians’ Pamela Souza won the women’s 200 breast in 2:31.66. Carolina Mussi, the country’s best ever in this event, was only 5th in 2:35 – a disappointing swim for her. Lotte Friis took her second win of the day in the non-Olympic 1500 with a 16:11.76, but she was cruising. That beat Argentina’s Cecilia Biagioli (16:13.84) in the #2 and #5 times in the world this year. Poliana Okimoto was the top-finishing Brazilian in 3rd in 16:47. After one day, Corinthians, thanks to big international points, jumped out to a narrow, 19-point lead. That’s nearly meaningless in a meet that hands out as many points (to as few teams) as this one does. Manaudou is entered in only 4 individual races (200 free; 50, 100 and 200 back). But you are right: she may be called for relay duties (3 more races). That’s a good training! Let’s see how she does on the 100 and 200 back. I hope she will be able to push Fabíola at least to the Olympic cut!